I’m very pleased to announce a brand new limited edition print release, Sweet Feast at the House of Pink Delights, added just this morning to my Etsy shop! Featuring dozens of happy little kewpie heads waiting their turn to be boiled up in a delectable stew of ice cream and cake, served table-side to gleeful diners anticipating an unparalleled delicacy of sweetness and joy. Each image has been professionally printed on heavy weight glossy paper using archival inks to bring out bold, rich blacks, and strong vibrant colors. I could not be more pleased with the quality of each and every print! Personally, this is one of my all-time favorite pieces, so much so that I use it as the banner for both my Facebook page and Etsy store, so it seemed only natural to finally release it was a signed limited edition print. More information is available on Etsy, right… here! She who creates Good Fortune, one of the most popular images from my summer show, is now available in a fine art edition of 40 prints, on high quality, heavyweight, Hahnemuhle photo rag paper! Each 19×13″ print (the image itself is 12×9″) comes signed and numbered, along with a certificate of authenticity and a limited edition exhibition card. If you’re nice I may also throw in one my extremely limited Frankenstein stickers (as supplies last, of course). This may be my best print release yet, and the images look great! More info about the print can be found in my Etsy store, and if you’re interested in the process behind the creation of the photo, here’s a link to my behind-the-scenes blog post. She who creates Good Fortune — $125 available now! The little elves in the Wind-up Dreams workshop have been very hard at work creating an incredible array of gifts designed around the portrait panels that were on display in Tales from the Vinyl Dimension including mugs, buttons, watches, mouse pads, coasters, iPhone cases, and a bazillion other things. Yes, they are exhausted little overworked elves, but as long as we continue to feed them candy corn and marshmallow peeps they seem to remain happy and productive. You can see the full lineup of gifts in the Portrait store on Zazzle. Finally, I’d be completely remiss were I not to remind you that original 12×12″ portrait panels from Tales from the Vinyl Dimension remain available, along with a wide range of limited edition prints, album editions, and postcards. She who creates Good Fortune — behind the scenes! It’s been quite a while since I last wrote a post on how I go about photographing and creating some of the images you’ll find on my web site, and with the release of a brand new limited edition print imminent I thought I’d chime in on some of the behind the scene shenanigans that went into the creation of that image — She who creates Good Fortune. The concept behind this photo would be the coming into being of an entity that was responsible for bringing Fate to the world through the creation of tarot cards. I envisioned an artist standing at an easel painting cards one at a time, with a stack of blank cards on one side and finished cards on the other. Surrounding the figures would be elements representing other celestial and mystical realms, while in the background an even higher mystical figure would look on. Playing the role of “artist” at the center of the new composition would be a figure I frequently refer to as “Marilyn”, solely because she is blonde and has a billowy dress. She was produced by the Marx Toy Company in a set of scantily clad figures known as “Louis’s Beauties”. Her pose, with one hand stretching forward and the other curved inward, would be perfect — so long as I could place a tiny paintbrush in her hand and set a “canvas” before her on an easel. And that’s what you see to the right. 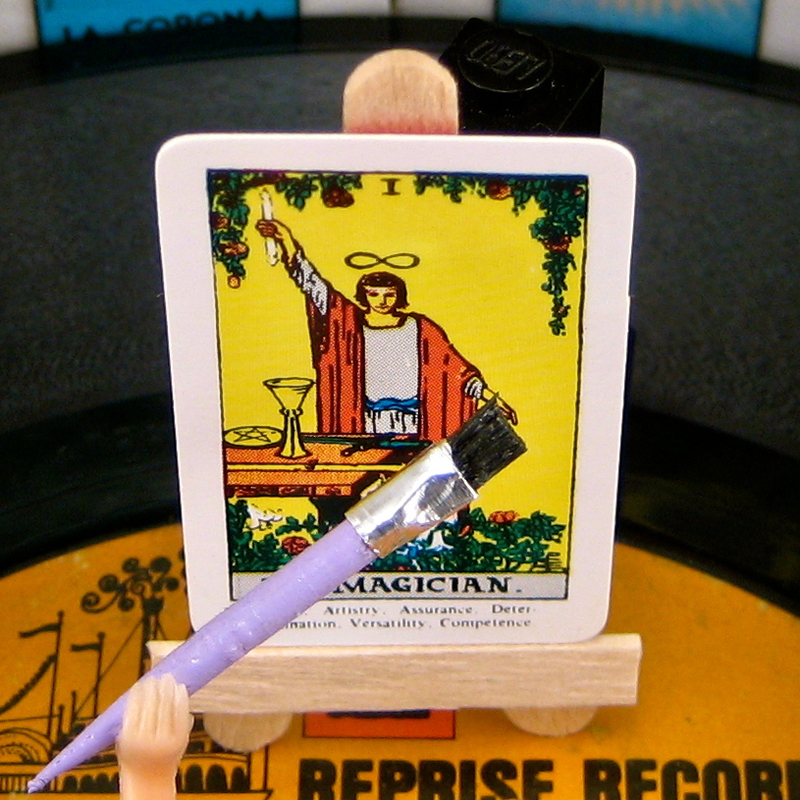 I fashioned an easel from wooden coffee stirrers (propped up by undetected Legos), while the paintbrush was made from the end of a toothpick and a skinny strip of aluminum foil wrapped around the snipped ends of an actual paintbrush. Over the past couple of years my process has become increasingly complex, with elaborate stage sets, and images that are sandwiched together from multiple focus layers (see a past post on the subject of creating focus stacks). Seriously, some of my photos take a month or more to produce. So, in preparing work for my 2013 summer show I decided to go “back to basics” for a set of simple landscape image: one record cover, one stack of 45’s, a primary figure, and maybe a couple of additional figures in the background. Deep focus? Forget it; I wanted the focus to only be on a single character emerging from the center of a record, and the rest of the image could be blurry — like real professional photography! For these photos I put away my DSLR and my nice L-series lens, and instead chose to use my “walking around” camera — a compact little Canon SD-1000 Elf with a built-in digital macro setting that would be perfect for getting up close and personal with the characters I wanted to highlight. I shot brides and grooms, belly dancers, religious icons, and all sorts of figures — all from a few inches away with a very shallow depth of field (focal length 5.8mm, aperture f/2.8). I was able to take each of these photos fairly quickly, spending not much more than a day or so shooting and adjusting the finished image, while retaining the conceptual and symbolic elements of my more elaborate images. Above, you see the final staging for She who creates Good Fortune. Very simple. 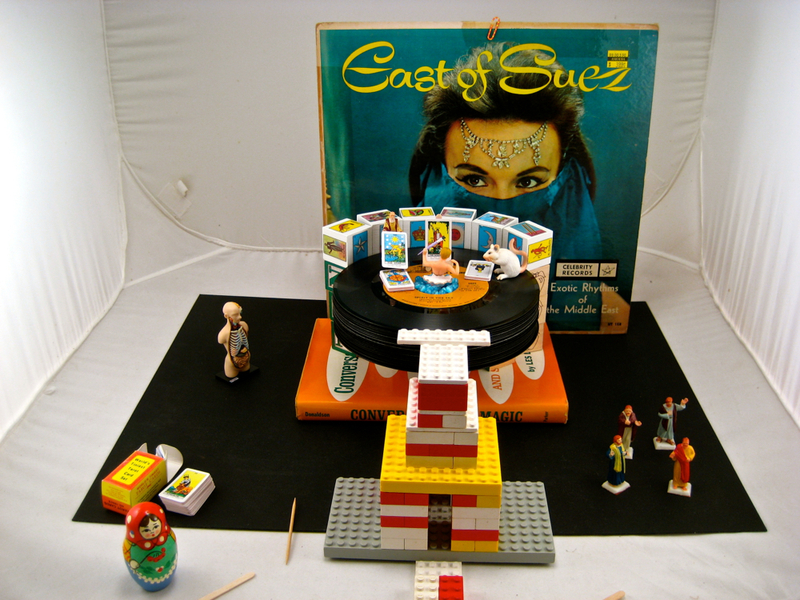 An album cover in the background, a stack of records in the foreground (actually balanced atop alphabet blocks in addition to the book you see), and a handful of objects used to tell the story. The whole scene, from back to front, is about 8 inches deep, with the dancer emerging from the stack of records about 4½ inches from the back. In front of everything is a crude tripod I built out of Legos to compose my shot and hold the camera steady. For this particular photo that wasn’t what I wanted. Focusing on the artist in the center of the record brought her nicely into focus, but left the card she was painting — and even the paintbrush! — out of focus. Likewise, the card being laid down and the mouse were fuzzy, and I felt those elements of the image were just as important (symbolically) as the artist at the center. So, it was back to my deep focus trick to mask out and combine the in-focus elements from multiple photos to construct a single image. 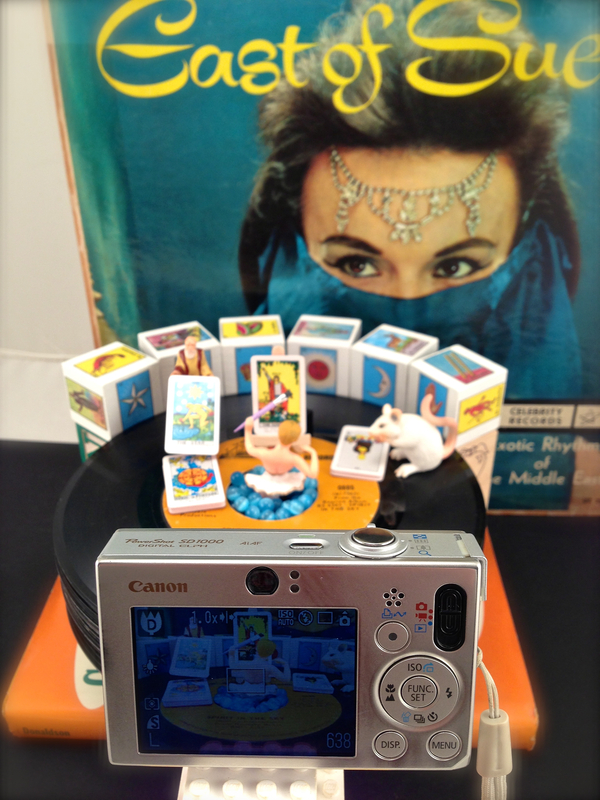 Luckily, for this photo, I’d only have to worry about two images: one that held the foreground in focus and one that held the background in focus (or, actually, just the two farthest tarot cards — the album cover and Loteria blocks could remain out of focus). Easy, right? 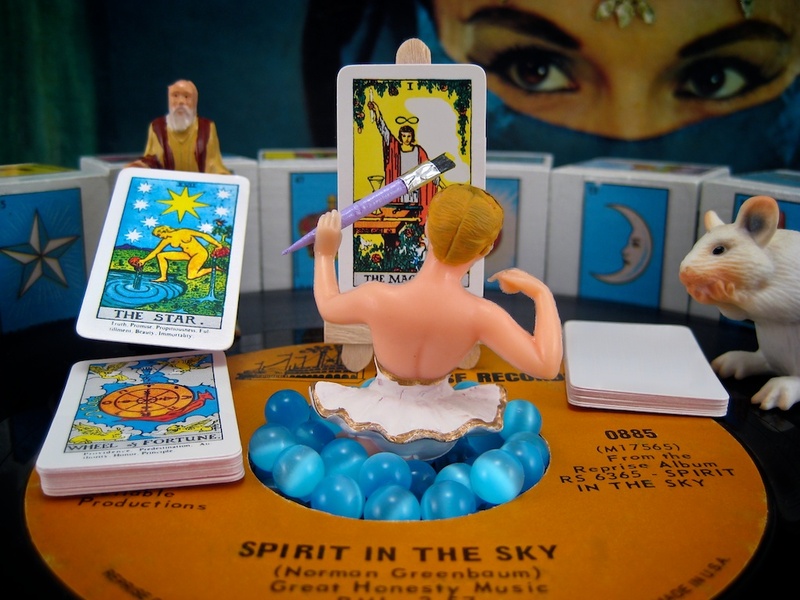 Take a look at the two photos below: one focused at the center of the artist’s back, the other focused on the tarot card she is painting. Apart from the shifting of focus from the area around the artist to the area just beyond the artist, notice anything slightly peculiar? Well now, THAT doesn’t look very good, does it? Yikes! the difference is now very, very noticeable! So much for my plan to simply place pieces of the foreground over the background. Note that most of the masked layers have been carefully shaped to completely encircle a given region (say, text on the label) with the perimeter of the “puzzle piece” falling on an area of uniform color and texture, such as the brownish-orange of the record label. By creating the layers in this way, and feathering the edges, it became much easier to blend the top layer into the image beneath. 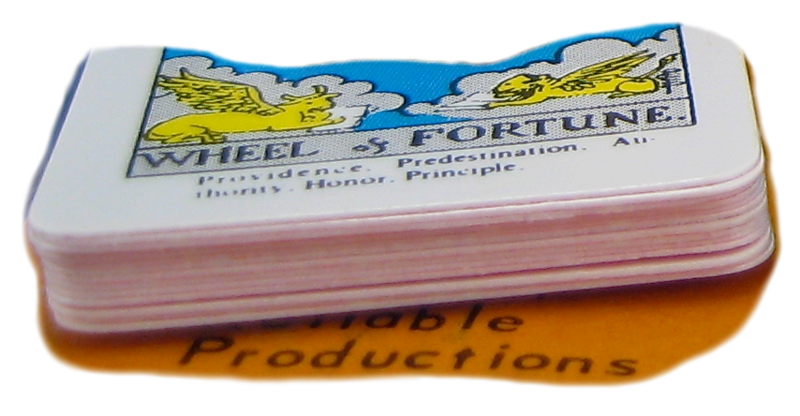 In some cases (such as with the Wheel Of Fortune region, below), this wasn’t possible, and the puzzle piece had to cut through a “solid” object. 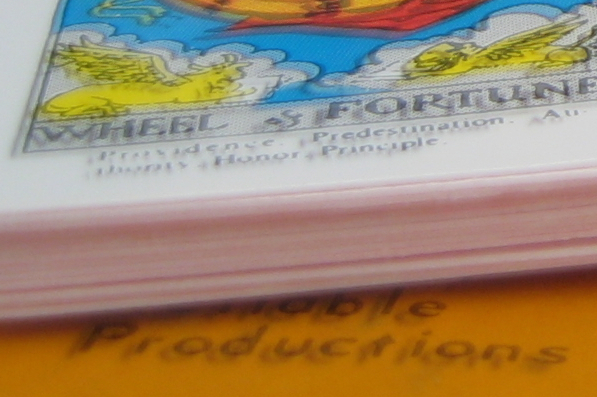 Even in these cases, however, you’ll notice that the edge remains — as much as possible — within uniform regions of the masked layer (as below, across the field of blue on the tarot card). Once all of the layers had been masked and output as transparent TIFFs, assembling the final image became an exercise of dropping puzzle pieces over the background and scooting them around until each was aligned (as closely as possible) with the background. 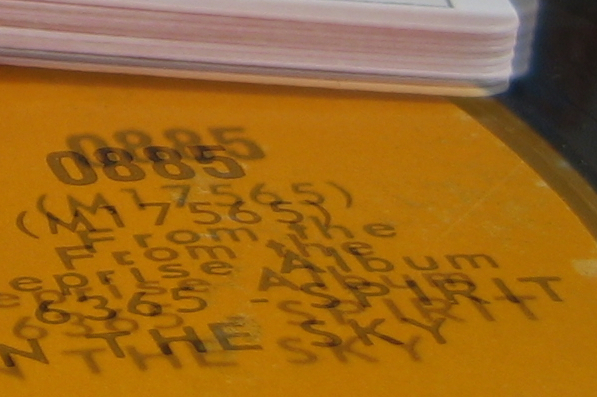 The animation below illustrates how this was done for the text on the right side of the label, first moving it horizontally and vertically, then rotating the image ever so slightly to compensate for the change in perspective from one photo to the next (eyeballing the alignment, of course). All told I created nine separate foreground layers to assemble the final image and achieve the look I had been seeking. 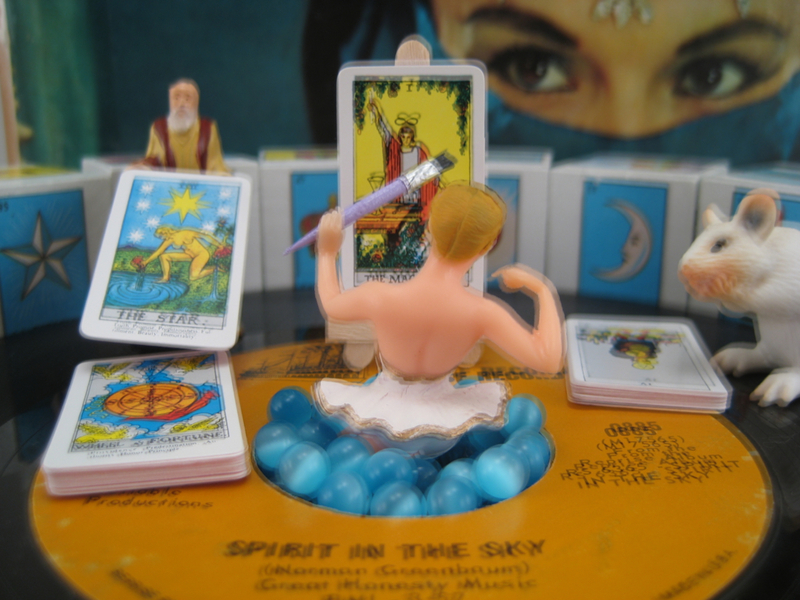 To finish off the piece, I selectively erased some of the background yellow on the tarot card being “painted” to create the illusion of the artist adding the finishing touches on a new card of Good Fortune. Likewise, the surface of the card on the right was erased to give the appearance of a stack of blank cards waiting to be brought to life. Yes, it was a lot more effort than I’d been anticipating, but I was more than happy with the results, and She who creates Good Fortune was one of the best received images in my summer solo show. One of my toys went missing! And not just any toy, my vintage Wolfman flashlight figure purchased a few years ago from a dealer at Comic-Con. 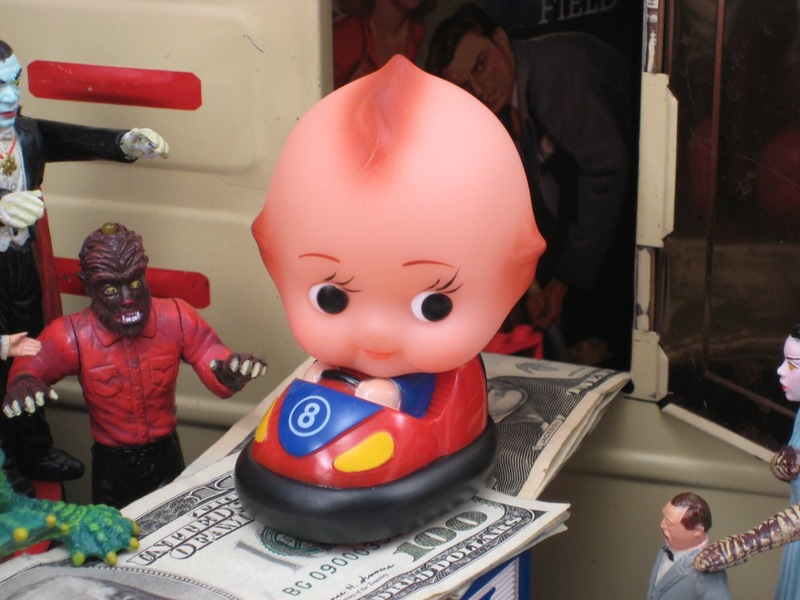 Wolfman has appeared in a handful of my photos, most notably terrorizing a kewpie car as it exited a funhouse tunnel in Financial Freewheeling and the futile pursuit of the American Dream (right). As part of the gallery installation I’d placed toys in front of each of the 12 x 12″ portraits that rimmed the highest walls of the space. With the actual toy present, visitors to the gallery could better sense the true size of the faces that were looking down from the walls. Where these portraits were printed “life size”, the subjects were little tiny toys shot with the digital macro setting of my Canon Elf (using a tripod fabricated from Legos). Each toy standing below their portrait was pretty much on its own without much in the way of safety or security. The Wolfman was one exception, as his clawed feet did not balance will on the wooden ledge, so he was held in place by a small mountain of modeling putty. The Pannikin sees a LOT of traffic — regulars buying their morning coffee, students studying in the afternoons, plenty of moms and dads pushing strollers. Had Wolfman fallen from his perch I thought there was a good chance that he’d been picked up by one of the stroller kids, whose parents might find it odd that there precious toddler was shaking a hairy beast instead of his or her rattle. 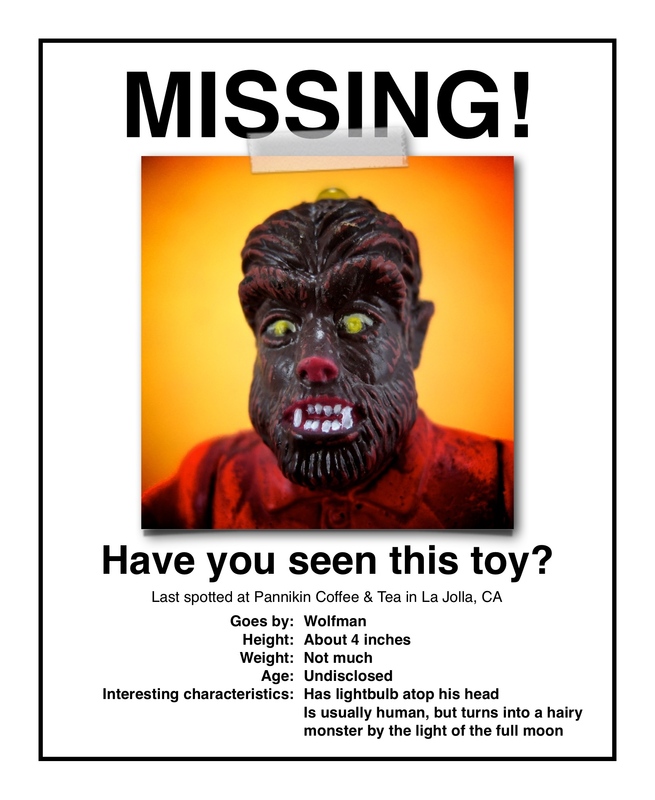 I tacked up the poster next to Frankenstein, hoping that my stab at humor might motivate someone (like a stroller mom or dad) to recognize and return my beloved missing Wolfman. A few days passed and, sure enough, the Wolfman was returned! If I am to believe the story that was related to me, one morning a homeless man stumbled through the door and without saying a word placed the Wolfman on the counter, then left. Wolfman was back! I pulled down my MISSING poster and in its place pinned up an replacement: FOUND! Anyway, in the wake of this trauma I began to imagine a whole series of “missing” posters for each of the portraits I’d shot for the exhibit. Take a look! So, what do I plan on doing with all of these crazy posters? All kinds of things! The first is to make them available on shirts through my Zazzle store. I currently have 30 or so designs available featuring most of the toys and figures I had on display during my show. More still to come and I’m hoping to extend the line to include other products. Announcing… Portrait Products in my online shop! More products! Tons of super cool buttons! And now… portrait mousepads! Scroll down to the bottom of the post for pictures! It’s been far, far too long since my last blog post, and rather than make up a bunch of lame excuses (blah, blah, blah, blah, exhibit, blah, blah) let’s get to some really cool news, shall we? I recently closed a solo show at Pannikin Coffee & Tea in La Jolla, with over 70 pieces of art on display including large photos, small “landscapes”, videos, and 55 “portraits” of many of the characters that have been appearing in my art over the past 8 or 9 years. 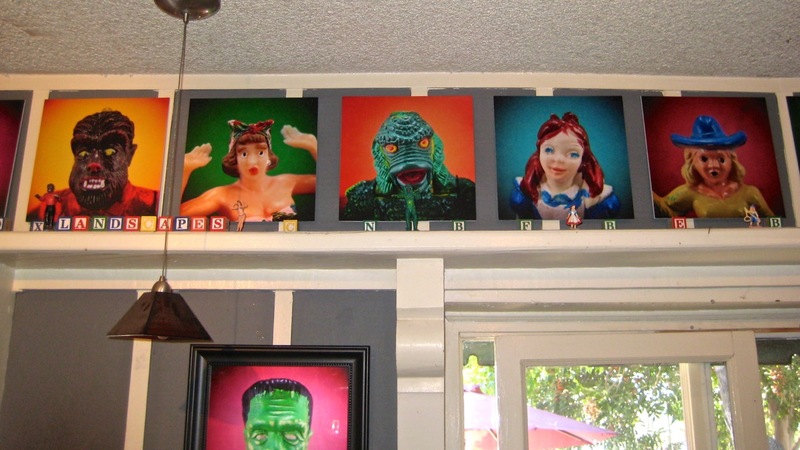 Originally, these portraits were intended to be nothing more than decoration: 12 x 12″ panels printed with a metallic finish on double thick mat board and mounted near the ceiling to look down upon gallery visitors while they took in the “real” art. The portrait panels were a big hit! There were robots, animals, kewpies, bathing beauties, devils and monks; pretty much something for everyone! Where normally these characters — even in my largest photos — are printed to a scale not much larger than their original tiny toy-size, here were seen at 25 times normal! Features you’d never make out with the naked eye were blown up to life-size proportions giving each character real personality in a way that connected with visitors to the gallery. Why not create a line of cool Portrait products featuring many of the characters that appeared in the exhibit? Think of possibilities! And so, I’ve very pleased to announce the first line of products featuring my portrait images! Beginning today you’ll find a wide selection of cool Portrait Watches and Portrait Mugs in my online Wind-up Dreams & Vinyl Nightmares shop. Watches come in a variety of different styles, allowing you to pick your favorite character and experiment with different styles and bands. The mugs (we have over 100!) come with three large images, or tiled with 24 repeating images all the way around. Swing on over to the shop, or checkout the update to the store page on my web site. Announcing the Wind-up Dreams & Vinyl Nightmares Shop! Great news in the land of Wind-up Dreams! What??! Huh?!?!? I thought they were evil and took down your products? Yes, they did take down a total of 20 products, which I previously detailed in a couple of prior posts, and those products remain in Merchandising Limbo. But that has not deterred our team of marketing masters from stocking the store with dozens of super cool Wind-up Dreams products! You’ll find everything from mouse pads to laptop sleeves, coffee mugs to messenger bags. Each piece lovingly crafted with your favorite images. So what are you waiting for?!?!?! Check it out!! Mugs! Mouse pads! Cases for iPhone and sleeves for iPads! We have bags and notepads, clocks and coasters, and even a couple sets of playing cards and desktop speakers. New products will be coming regularly, and I’m more than open for suggestions if you don’t find exactly what you’re looking for. Remember — the holidays are upon us! And don’t your favorite people deserve a little bit of Wind-up Dreams & Vinyl Nightmares in their lives? And, don’t forget, the I Support FAIR USE store is still going strong, selling t-shirts, mugs and bags to call attention to censorship in the arts! I hope you enjoyed my first installment on Copyright Confusion and Fair Use, and the saga that has been unfolding as I attempt to make my artwork available on custom bags, mouse pads and other fun print-on-demand products sold by Zazzle.com. Thanks for coming back! Today I’ll be continuing the story with lots of information about your rights as an artist. We’ll also talk about copyright and discuss what websites such as Zazzle can and can’t do with regard to your content. Yes, we’re going to toss around some legal stuff, but legal stuff is oh-so-much-more-fun when it revolves around pro golfers, prima donna rock stars, and raunch novelty rap acts, wouldn’t you agree? So read on, and at the end of this article I’ll have pointers for how you can join in my crusade to support FAIR USE through a new blog, a Facebook page, and — yes! — through self-censored, “copyright friendly” versions of my Wind-up Dreams & Vinyl Nightmares photos on everything from t-shirts to tote bags. Oh yeah, disclaimer! I’m not a lawyer, neither professionally or in any amateur capacity. Still, I hope you find the information informative, enlightening, and entertaining. What bothered me about Zazzle’s claim is that the appearance of an Elvis matchbook in my photo is protected by Fair Use, defined in the Copyright Act of 1976 as an exception to copyright law allowing the use of copyrighted material in transformative ways. It’s what allowed Duchamp to put a mustache on the Mona Lisa and Warhol to silk screen photographs of celebrities. 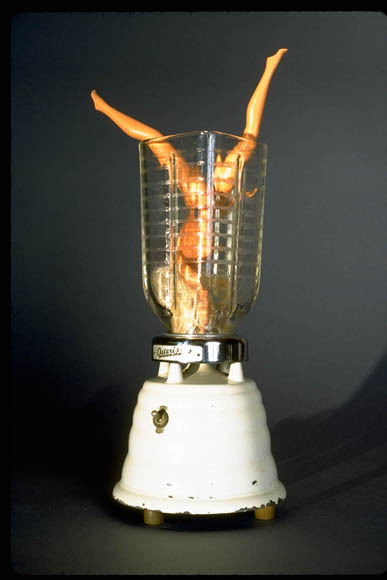 Fair use has many tentacles in the art world, some valid (Barbie in a blender! ), others not no much (the US Postal Service taking a photo of a sculpture and placing it on a stamp). The Fair Use exception amounts to only 175 words in the law, but—oh!—how those words have been tested and applied to a wide variety of copyright disputes! I don’t mean for this post to be an in-depth debate on what constitutes fair use, so I’ll just focus on a few noted decisions from the courts to illustrate why my photos (and countless other works of art) satisfy the most prevalent arguments for Fair Use. Ugh! Legal stuff. ::: yawn ::: Boring! No, wait, this is cool! In this landmark case the rap group 2 Live Crew was sued by the estate of Roy Orbison over a raunchy parody of Orbison’s song, “Oh, Pretty Woman.” The case went all the way to the Supreme Court with 2 Live Crew insisting that their version of the song was protected by Fair Use. The Court ruled in favor of the band and, in their summary judgement, had much to say about the transformative nature of Fair Use beyond the 175 words that define the law. Given the Supreme Court’s opinion, had my art focused on only the matchbook, uploading to Zazzle the face of Elvis to be placed on my own set of commemorative plates, my use would clearly not be protected by Fair Use. I’d just be copying (i.e. “merely superseding”) the original, and I’d be in violation of the copyright held by Elvis Presley Enterprises. But that’s not what I did in my photo. In Backstage Pass, the image of Elvis is merely one element within a complex conceptual narrative. In other words, quoting from the Stanford University Copyright and Fair Use Website in offering their interpretation of the Supreme Court’s ruling, “…the material has been used to help create something new.” There. Fair use. In the days following the rejection of products designed using Backstage Pass, I received dozens of additional rejection emails covering a total of 10 of my original photos—all judged by Zazzle’s content review team as having violated the copyrights of others. The characters found to be in violation? 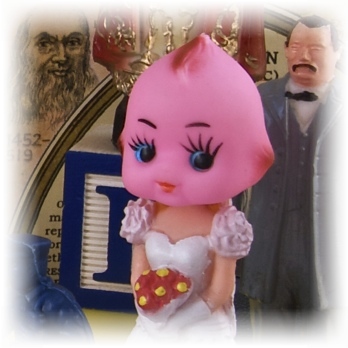 I defy any website, court, law student, or scholar to determine that the placement of a pink kewpie head on the body of a plastic bride, with Leonardo Da Vinci and Grover Cleveland looking on, is not a valid example of fair use. Kewpies play a particular and recurring role in my work, to the extent that individual kewpies (red, green, pink or yellow) add very specific symbolism and character to a given photograph. Likewise, the “Beatle” figures I use in many photos (actually, manufactured in Asia during the mid 1960’s and sold as “The Swingers Music Set”) are not intended to be a literal recasting of John, Paul, George, and Ringo. Like the kewpies, the presence of these blue-suited figures is symbolic, contributing to the conceptual arc of a given photo through their facial expressions and placement within a given composition. Unfortunately, celebrity names and/or likeness (sic) may not be used for commercial resale on Zazzle.com without permission from the celebrity, their legal representative or their estate. The issue is not with you creating the art of Elvis, the issue is Zazzle selling the artwork images. 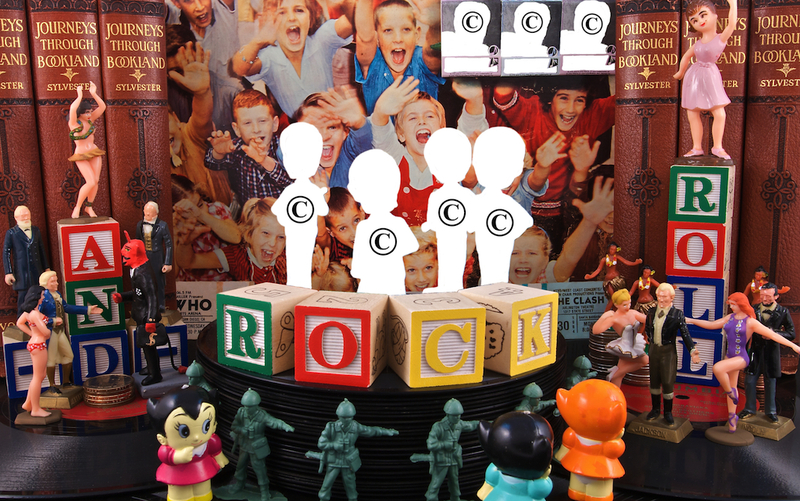 Zazzle has been contacted by Elvis Presley Enterprises and they have submitted a DMCA notice. In accordance to following the notice, Zazzle cannot carry any images of Elvis Presley. Oh really? Unfortunately, that’s not what the law says, and Zazzle may, in fact, be suppressing the rights of artists who wish to post and sell products created under the protection of Fair Use. Or, perhaps, they’re simply making a business decision to err on the side of caution and choose to ignore Fair Use as a valid form of artistic expression (note how the issue is deflected in the second response above). I can’t say, as recent emails asking such questions have gone unanswered; as have requests for a copy of the takedown notice Zazzle claims to have received from Elvis Presley Enterprises in reaction to the posting of products containing my Backstage Pass photo. Hey! What about Elvis’ right to his own face! It makes sense that a celebrity or public figure would have the right to control how their image is used and marketed. In fact, they do! Under the Lanham Act; a broad piece of legislation that protects trademarks and establishes the “right of publicity,” the use of an individual’s name or likeness is protected from being used in a manner that would imply some unwanted affiliation. In other words, in a world without the Lanham act businesses would be free to Photoshop anyone they liked— Lady Gaga! Peyton Manning! Oprah! —into their advertisements without consequence. Taken alone, the Lanham Act would seem to support Zazzle’s claim that images of celebrities can’t be used without permission. Ah, but the law is complicated, and the “right of publicity” is not incontrovertible. In fact, it is superseded by… you guessed it, Fair Use! Let’s take another look at some case law (and I promise it won’t be dry, boring, or filled with Latin terms). ETW Corporation v. Jireh Publishing, Inc. Sounds like two big businesses butting heads, doesn’t it? Well, in this case ETW Corporation is the exclusive licensing agent for golfing great Tiger Woods, who sued artist Rick Rush over a painting Rush had created following Woods’ victory in the 1997 Masters tournament. 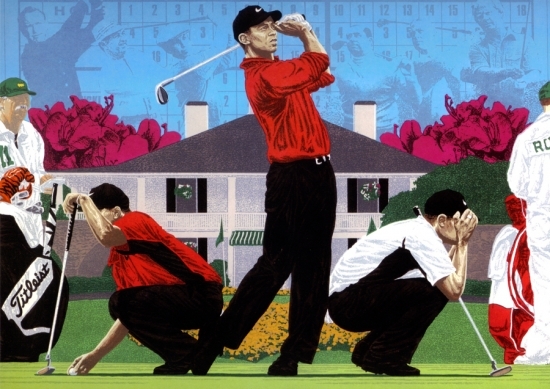 Attorneys for Tiger Woods argued that Rush did not have the right to use the image of their client in his 1998 painting, The Masters of Augusta (left), claiming Woods’ “right of publicity” under the Lanham Act. The judges in the case ruled that the right of publicity is limited by the principles of Fair Use, and—where Rush may have lost the case if his painting was a straightforward portrait of Tiger Woods—the work was transformative in the sense that the image of Woods had been incorporated into a much more complex composition that included other Masters victors and elements of design that put Woods likeness in historical context. So, given the precedence of the decision above, to what degree can Zazzle claim that designs incorporating a celebrity likeness (like Elvis on a matchbook cover) are unacceptable, without also considering the protections offered by Fair Use? Is Elvis just a bully? To read Zazzle’s response to my email inquiries, one might assume that their corporate hands were tied, locked in a legal full nelson by the ghost of Elvis Presley, and bound by the stone tablet orders of the DMCA to “not carry any images of Elvis!” Convenient though that belief may be, the law around Fair Use and the Digital Millennium Copyright Act (DMCA) counters such absolute restrictions. In fact, copyright holders must consider Fair Use before instructing a website to remove material from their site; there’s really no such thing as a blanket “take down all things Elvis” order. I’m going to sneak in one last legal case, because it reinforces my argument and—yet again—is mildly entertaining. This one comes from YouTube and it’s known officially as Lenz v. Universal Music, a case where the plaintiff saw a 29 second video of her toddler jumping around to “Let’s Go Crazy” by Prince removed from the video website. Lenz countered that the use of the song (distorted and in the background) was Fair Use. Though YouTube eventually reinstated the video, Lenz took Universal to court on the basis that they had incorrectly interpreted the DMCA by not considering Fair Use in issuing their takedown notice. Universal countered the counter by releasing a statement that their intent was to rid the internet of all user generated Prince-related content, simply as a matter of moral principle. This was a particularly bad idea and became an issue in the suit, as Lenz argued that Universal was abusing the DMCA by issuing blanket takedown notices rather than considering alleged infringements on a case-by-case basis. Lenz won her case, and the court ruled that copyright holders must consider Fair Use before requesting that a website remove material uploaded by their users. Notify users when their material has been down. we’ve been told it infringes on someone else’s copyright. Provide users with an opportunity to challenge the removal of materials. The user can then send in a counter-notice stating why they believe their material does not infringe on another copyright. My image is protected by Fair Use under the Copyright Act of 1976. At this point, the website must promptly notify the copyright holder that their copyright is being challenged. that his image violates your copyright. The copyright holder then has 14 days to file suit against the user who posted the disputed material. If the copyright holder chooses not to file suit (perhaps agreeing that the use is fair, or simply not wanting to take the matter to court), the website is required to restore the materials that had been removed from their site. That doesn’t seem so hard, does it? In fact, it’s exactly what other sites do (YouTube, for example, which provides a convenient online dispute form) to fairly manage disagreements between copyright claimants and the users who upload files. So, no, Elvis is not a bully. I simply question whether he (or The Beatles, or all those adorable kewpies) is being included in the conversion. Tap, tap, tap… Hello? Is this thing on? Promptly… notify… the copyright… Oh, never mind. Who knows? At step three I made my claim for Fair Use, and rather than see the process continue to some conclusion that would involve my dispute being provided to Elvis Presley Enterprises, I was told by a representative of Zazzle that there was nothing that they could do; hiding, effectively, behind a very limited interpretation of the Digital Millennium Copyright Act. This is not the way the DMCA is supposed to work and it is certainly not fair to artists and designers who have legitimate claims to publish and profit from the art they have created. Furthermore, for the two dozen or so product designs that were taken down, Zazzle has followed the first three steps of the dispute process in only one case. Though I have responded to every notification with an email requesting additional information, Zazzle has failed to respond, except (on three occasions) where they simply passed the buck and identified the copyright holders making claims against the art I had uploaded. I’d like to assert my claim of Fair Use for each of the deleted product designs, but this is difficult to do when emails go unanswered. As things stand today, a couple of weeks following the initial flurry of product rejections, none of my disputed content has been restored and Zazzle’s content review team has been mum on prior claims of Fair Use. The good news, though, is that no additional products have been rejected, which is a bit maddening, as many of these designs are based on the same images, uploaded the same day, but applied to a different class of product. So, where one image was rejected as a mousepad, it has yet to be flagged for copyright infringement as an iPhone case or a tote bag. Baffling. Though Zazzle has stonewalled in replying to my requests for more information, my resolve will not be hampered. I plan on issuing formal counter-notices on the grounds of Fair Use for each prior rejection. Tedious, yes, as often the same image was rejected in the design of multiple products. Hopefully, with Fair Use on my side and by working through the process defined by the DMCA, I’ll convince Zazzle’s content management team to follow through (as they are legally required) and notify the copyright holders of the challenges I am within my rights to raise. 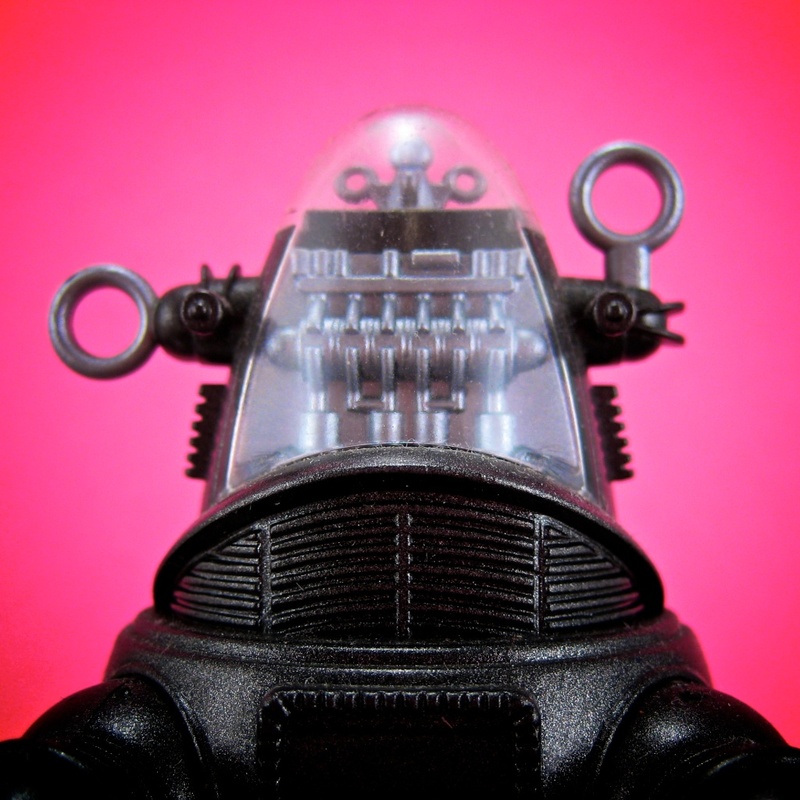 As stated near the beginning of this article, I like Zazzle. I think they make good products and I’d like to see my art featured on a wide range of their products. I yearn for a big, chubby-cheeked kewpie surrounded by buddhas and bathing beauties, cheerfully gazing from the back of my iPhone, but Zazzle tells me that my art infringes on the intellectual property that lives, apparently, in the DNA of a kewpie. And the Beatles. And Elvis. Until otherwise resolved, those figures as persona non grata on a Zazzle product. And so, with the store I want to open currently in copyright limbo, I’ve decided to open an alternate store filled with “copyright friendly products” meant to bring attention to the case for Fair Use in fine art. Kewpies? Vaporized pixel by pixel in the merciless purgatory of a JPEG’s alpha channel. To that end I sharpened my digital editing tools and created censored versions of each of the 10 photos Zazzle had flagged as unacceptable for product designs. Below is the censored version of Backstage pass in the ninth circle of Hell. No Elvis, Beatles, or the Rolling Stones! The Elvis matchbooks have been whited away; the Beatle bobble heads, removed. (No Rolling Stones in the photo, but you will note a ticket stub from the Clash concert on the right side). In their place, the symbol for copyright, which as far as I know is fair… to use. The new shop—I Support Fair Use—is now open! Come on by to see the censored versions of my art and maybe buy a mug so you too can support Fair Use while you sip your morning coffee. And while you’re sipping that copyright friendly cup of morning joe, please visit my new Tumblr blog where I’ll be posting all kinds of example of art that benefits from the protection of Fair Use. Drop by the page, give it a like, share it with all your creative artist friends (and their friends, and their friends’ friends)! Fair use and the creative freedom it affords artists in the expression of their artistic vision is IMPORTANT. Fair Use exists for a reason. It protects the work of countless excellent artists from Ron English to Isabel Samaras, Todd Schorr and Alex Gross, to Jason Freeny and Shepard Fairey. It will continue to protect the work of artists in generations to come, especially as technology and the ability to share and distribute content evolves—but only if we stand firm and defend the rights we as artists are clearly entitled to exercise, as there are no bounds to the imagination, and unjust restrictions to our creativity should not be tolerated.